Let's chat. Do you enter book giveaways? I use to enter all the time but lately I rarely enter unless its for a gift voucher. I do if it is a book that I want to read - normally it is because it is an author I want to try. I used to a whole lot more than I do nowadays. I've won so many over the years that I've nearly filled my bookshelves to overflowing (with a few I bought here and there). So unless it's a book I really MUST have, I don't. I also love frequenting my library on a regular basis or borrowing from my Overdrive library for ebooks to read on my Kindle. I review for many authors so I tend to get books that way or from Netgalley. So really, I have no lack of books to read...and probably won't ever in my lifetime, lol! I used to, but these days most are limited to US residents or only offer an e-book for international entrants (even when the book is by an Australian author)(I don't read e-books). Confession: Sometimes I did enter as a way to try out a new author - that way I didn't have to buy the book. Hi Beth, From an author perspective, I like that readers enter giveaways to try new authors. I also think readers pay more attention to print book rather than ebook giveaways. 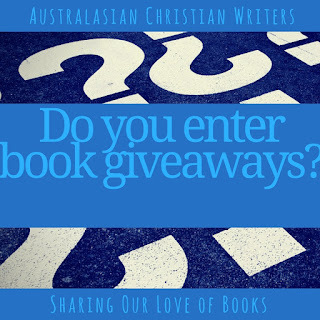 When Solo Tu releases on May 29, I’m doing a print book giveaway on the International Christian Fiction Writers blog that’s open to international entrants (as long as Amazon will deliver to their mailing address).